I know I’ve “been to church” when I’ve spent intimate time with God, or worshiped God. And yes, worshiping God can (and should) extend beyond the walls of a church building. God is not tied to any building we construct; His presence stirs all around us. And as such our worship is free of set rituals. Worship is simply our response to a God who initiates His love for us. 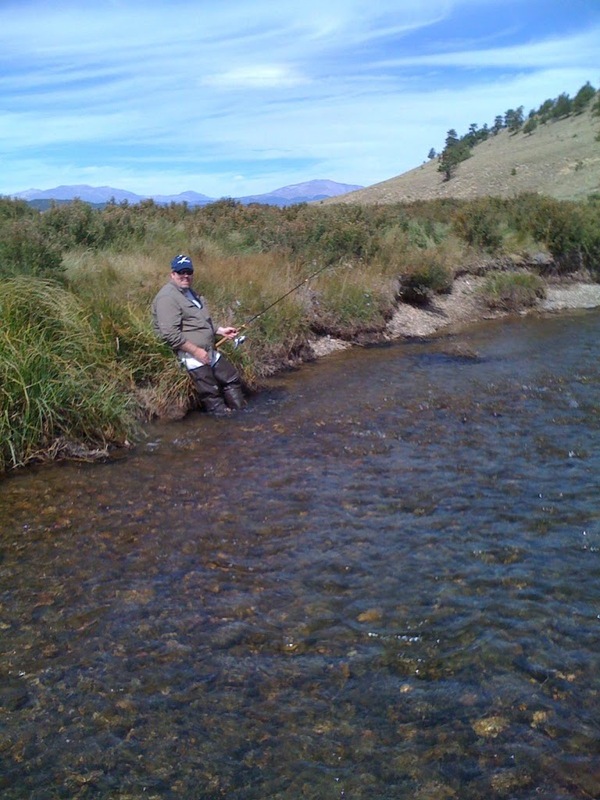 On Colorado’s South Platte River, I worship God, waving my fly rod to the rhythm of an age-old symphony. I thank Him for the mountain majesty in all directions, for the water flowing over my boots, for the curious deer on the ridge, and for the simple blessing of being in this place. I love being alone with God, unhindered, without distraction. But there is another aspect to church, a more accurate definition: community. We are also meant to worship God together, to share in His presence with each other. Jesus said, “For where two or three have gathered together in My name, I am there in their midst” (Matthew 18:20, NASB). Community reveals another dynamic of God’s nature. Last Sunday, God used the time alone to calm me down, take my eyes off of my problems and turn my heart toward Him. I needed a pause–nothing more, nothing less. This Sunday (with David), God brought sense to where I’d left off. I caught a few answers to the bigger questions and, coincidentally, caught a bigger fish. (smile) My heart was prepared to listen. Spending the day with a close friend, a brother even, allowed me to hash out the turmoil inside. I know David’s heart for the Lord, and sharing with him brought a fresh perspective to what I was seeing, and more importantly not seeing. As David allows God to work in his life, that wisdom sheds light on my own life–a benefit of not going solo (see The Master Belayer). Iron sharpens iron–the blessing of community. Here’s a video from our time on the water: I’m reeling in a rainbow trout…slowly. I learn more through the process of retrieving a fish versus the end catch itself–things like proper line tension, rod angle, exhausting the fish appropriately, remembering to breathe (smile)–tactics that improve my skills for the next cast. Because when we rush through, they often get away…just like answers. A short aside… If you’re a fan of author Jerry B. Jenkins, this spot is not far from his Colorado writing “cave”. A beautiful area. I hope you enjoy! Sara & Jennifer–thanks for stopping by! We all want to get back to Eden, don’t we? That desire in each of us proves that we are destined for so much more. I was right with you on that river.Loved this: “…waving my fly rod to the rhythm of an age-old symphony.”I often feel closest to God on a fishing boat, or standing shin-deep in a river. Thanks for this. That you brought a friend … isn’t that the meaning and purpose of “church”? Being the body of Christ, reaching out. being ALL things to ALL people that some may be won. Makes me smile today as Jesus was known for going away from formal church quite often to walk up a mountain and get some alone God time. Amen bro! Amy, hey, deep fried turkey and fish! (just not fried together!) :)Brad, I still lean way toward your side on this one. I get more than enough time each week (sometimes too much) being around people. Getting alone recharges my spiritual batteries. I do NOT get enough isolated time with God, which is such a treasure when I do. Thanks for sharing! Great follow up. I still like going alone, though, to the big woods. I think I get enough community and face time and iron-sharpening during the week that the going away time is just for me and God. I am jealous of that time. Plus I don’t want to share my bunk with anyone. If you and Bob catch any fish (and clean them) maybe we can have fish for Thanksgiving! ha ha Oh, I forgot to congratulate you on the Dolphins winning a game on Sunday! Woo hoo!